The smartphone is one of the most frequently used gadget of our era, It continuously requires charging, To make the charging process easy and faster Tagg launched Roadster Qualcomm Quick Charge 3.0 Dual USB Charger. It comes up with the fastest and most efficient USB charging technology Up to 4X faster than standard chargers capable of charging compatible devices to 80% in just 35 minutes of time. TAGG Roadster is the best car charger under 1000 rupees in India. Here further in the post, we have explained a bit more about this trending gadget. One of the best features of TAGG Roadster is even non-quick charge devices get the fastest charge possible. Roadster charges all non-quick charge 2.0 phones with adaptive charging technology and advanced SmartQ technology which smartly detects connected devices and chooses optimum current to charge at the fastest speed possible. Works with Type C, Micro USB, and Lightning USB slots. The Multiple built-in safeguards protect your devices against excessive overheating and overcharging ensuring your device receives the full reliable power every time. One of the smallest USB car chargers available in India that makes it easy to carry and handle also featuring two USB ports and an LED light for after dark. 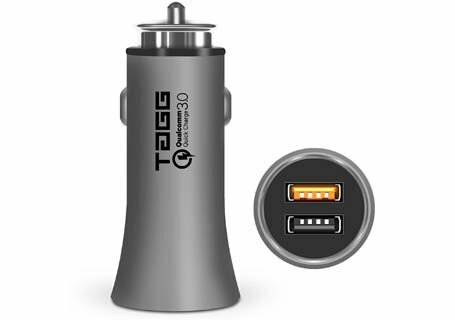 This Quick Charge 3.0 Dual USB Smart Car Charger is not limited to charging only Smartphone it is also designed for tablets, music players, cameras, and other electronic devices. One port of this gadget can give output up to 3.0 Amp current and the other one can give output up to 2.4 Amp current. Whether you are going out with family or friends don't ruin your day without power. TAGG Roadster is built tough with a thick one-piece molded ABS plastic shell, full metal spring contacts, and aluminum grip. It is sturdy and not easy to break also designed to withstand in hot and cold temperatures, low and high pressure, and is rugged enough to withstand drops and shock. So if you interested in the product that can charge your smartphone 4X faster than standard chargers you can go for TAGG Roadster in minimum price.